For the first time, there are 2 movies with Snow White-themed movies being released in the same year. One of it is a comedy while the other tells a darker version of the childhood fairytale. I ended up watching the latter called Snow White & The Huntsman. This movie is not your typical princess meets Prince Charming, who later falls in love with each other & an evil queen who threaten to murder Snow White with the poison apple. The story is about the evil Queen Ravenna (played by Charlize Theron) taking control over the kingdom after killing King Magnus. During the commotion, Snow White (Kristen Stewart) failed to escape & was locked up in the tower for several years. When she managed to escape, Queen Ravenna hired a huntsman to assassinate her. This is because the magic mirror revealed that Snow White is now the fairest of them all & will soon rise to fight the Queen for the kingdom. The Huntsman (Chris Hemsworth) obviously oblivious to the Queen's intention when he is hired because all he cared was the monetary reward that entails. As soon as he discovered who the victim is, he changed his mind & decided to help Snow White instead. While the movie maintains the main elements of the fairytale - poison apple, the 7 dwarves - the twist is that Snow White actually learns how to fight & lead a group of army to the battleground. What I found strange & awkward about this movie? The on-screen chemistry between Kristen Stewart & Chris Hemsworth just didn't work out. 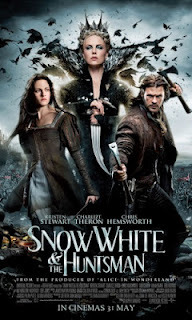 Hemsworth is undoubtedly attractive & effective as the rugged Huntsman but Stewart as Snow White may be beautiful but her acting skills play against her. I hate to say this...she always seem to look constipated albeit trying to portray a painful, emotional expression. Not to mention, she lacks expression most of the time in the movie. On the other hand, Charlize is ravishingly beautiful & very, very evil. She's probably the reason why I bought the tickets in the first place.